This week we were sent a copy of the new book, Pick Your Stitch: Build A Blanket by Doreen Marquart (Martingale Press, 2015) to review and giveaway – better yet we’re throwing in the Berroco Vintage Chunky yarn to knit the “Forked Blanket” project from the book. The book is well laid out with written instructions and photographs of swatches that are large and clear. Each swatch has instructions for the stitch repeat followed by specific interactions for creating a block from that pattern. The next section demonstrates the stitch patterns as blankets – you can either knit the blanket shown or use the patterns as a jumping off point for creating your own design. It’s a great guide for anyone looking for a creative knitting challenge. Are you ready to design your own blanket? Tell us why in the comments section and you could win a e-book copy of Pick Your Stitch: Build A Blanket and the yarn to make Doreen’s “Forked Cable” pattern! Details: Must be 18 years or older and a resident of the U.S. or Canada to be eligible for the prize. Comments must be posted by 11:59 PM EST on Sunday, January 18. One winner will be chosen at random and announced on the blog next Monday, January 19. Just thinking this morning that I should knit each of my grandkids a blanket. All 17 of them! Of course they all have to be “original”. love to design own blankets using yarn left from finished projects. I’d love to make a new blanket. My family room is FREEZING! I am ready to design and knit my own blanket because it has been colder here this winter than ever before in my memory. I need a snuggly blanket for my couch! There is nothing better for those cold cold dreary days (and eves) than snuggling under a hand made blanket, cup of steaming favorite beverage nearby, and knitting (while listening to Glen Gould). I love knitted texture on large scale. I’d love to make something for the end of my bed. I have already decided my next project is a blanket and have been trying to find a pattern I want to try, but not finding it. I would so love to design my own or make a sampler one! And then make some to give away; all unique! And I love Berroco Vintage Chunky. Afghans are one of the knitted items that my family likes best. We have a big wrap-around couch and I have three afghans that are usually all taken when the family sits together to watch TV. I would LOVE to make another one that I design myself! I’ve designed my own afghans/blankets before and love doing it! So much fun to see your ideas become a finished product. I’ve been wanting to start designing, and a blanket seems like a good, easy way to start. Would love to learn this cable pattern. Love the color. After a week of below freezing weather, it would be great to design a blanket and then wrap myself in it. I have been thinking about a sampler for a while to learn some new stitches. What a great way to do it. Love learning new stitches and apply them in different items! Love this blanket! My daughter could use a knitted blanket. It gets cold at her college and a blanket is a warm hug from home. it’s been a while since I made a blanket but I love the veratility of that yarn. For almost 10 years I have knit at least 1 blanket per year. I’m an experienced knitter who has designed my own socks and rarely knits a sweater without design changes, yet I’ve never designed my own blanket. It is high time I did so, especially since my youngest is a freshman in college and is the only one in the family without a hand knit blanket from Mom. Thanks for yet another wonderful give away! My older son just got married without warning so I need to come up with a gift I have made! Love to make a blanket for the new great grand child due in April. Knitting a blanket in the winter is perfect. Keeps me warm as I knit. I’ve been knitting for a few years now and I’ve only knit one baby blanket so far, so I’ve been thinking about knitting a blanket for my own place for a little while now. This would be a great nudge to get me to actually get started on one! I love the stitch and the color. Berroco vintage chunky is one of my favorite yarns to knit with. I have made some beautiful cabled hats this winter. Every time I start a new project (and there are many), my 7-year-old begs me to make her a blanket. Nothing like a home made blanket. And, you can never have enough blankets! There’s something about a handknit blanket that just says love. And what could be better than designing, knitting and sharing a warm blanket with family! I would really like to improve my knitting skills and this would be the perfect project!! I’ve only made one blanket before and it was a struggle as the pattern didn’t thrill me but the recipient of the gift did. I would like to try making one that holds more interest and this book sounds like a great source of variety and information. Just ready to design and knit my own blanket because it has been so cold in Montreal this winter. And I just love to design some pieces when I can! I love to snuggle in a warm blanket to watch TV in the evening! The one I use is getting ragged – time for a new one! Would love to design one for myself! Would love to pick a stitch and make a blanket for my family to snuggle with each other. Hubs has been asking for a cuddling blanket for the couch. This book and yarn would be perfect! It will make a great gift for my new niece! I love making blankets with my knittting group, we make wedding blankets and baby blankets in knit patterns and sew the squares or strips together. Knit blankets make amazing gifts! Would be fun to try designing a knit project. The book would be an inspiration to make that happen. I have a new (and our first) grandchild – a little boy named for my father. 🙂 I’d love to be able to make something very personal for him now and later. I love creating things, so why not try my hand at designing? It would be fun interesting to knit and assemble a variety of patterns. My son is in college in Maine – I know he’d love it! My knitting goes in cycles, and right now I just really want to knit blankets!! My knitting goes in cycles, and right now I just want to knit blankets! There is a wedding I need to knit for and a couple of babies coming up! This book sounds amazing. I love to make blankets for others. I like to use patterns I find but I need to branch out and design my own so that my gifts are truly personalized. This would be a great start for that. Thanks for the chance to win! I design my own quilts but so far I typically follow patterns for my knit projects. Would love to design some of my own blankets! Love, love, love the look of this! My colors exactly! I’d really love to copy this…..was just getting ready to purchase the yarn and book for an earlier version of this, but, Oh My!!! Love, it, love it, love it! WOW! I would design a blanket that would be unique and one of a kind. Need to send a new blanket to a beloved aunt freezing in Ohio–Thanks for the giveaway!! I love the process of designing, & sampler blankets are always so interesting. Plus, it’s 10 degrees here & dropping – a blanket project sounds perfect!! Always in need of something warm to wrap up in during the cold months. I’d love to create another blanket to cove up with. I am so ready to try this. First, I enjoy seeing patterns emerge in my knitting. Second it looks like it would be a great take with you project. I am currently working on an afghan on my own design. I like doing something different. I have been wanting to cast on a blanket for my son & daughter-in-law but just couldn’t decide which one. Would love to win the book & yarn! Thanks for the giveaway. I would like to add more knitting experience to my arsenal before I try my own blanket. I can always use more blankets in my freezing house, and I’m up for the challenge of designing my own! I have a new grandchild on the way who needs a blanket from grandma. Grandma needs a new knitting challenge. Designing the blanket myself seems to fit perfectly. I want to explore designing, and a blanket is a great canvas to get started. I’ve been wanting to make a blanket/afghan for my couch, but haven’t found the pattern I want, so this could do the trick! Gosh, I’ve been wanting to knit an afghan for a long time now. Just haven’t decided which one. This could be an omen. Thanks for the giveaway! I love knitted blankets!! They are so warm and cozy! I *love* this idea! This past year was one for baby blankets; there were several patterns used, that I Liked, but how much nicer had it been MY pattern. I would love to try my hand at this sampler blanket as I am new to knitting( old crocheter!) and believe this would be a fantastic way to learn. I’d like to make a blanket for my grandson, Drew, four years old. I have been crocheting afghans for over 40 years and I have decided that it’s time I try my hand at knitting. I love this pattern and design and would love to give it a try! It would be great to design my own blanket that would fit my home decor. My 86 yr old Mum needs a cozy blanket for reading and napping on her sofa during this long cold winter! I’m a new knitter, and I’m looking forward to making my first blanket! Learning new stitches is so exciting for me. I’ve been crocheting for about a year, and coming up with new ideas is always fun! I love using stitch patterns to design my own projects. I’ve made a lot of blankets, but they all use the same pattern. I am ready for something new and different! I have been healing a broken leg since Thanksgiving when I was placing Christmas lights on top of my kitchen cabinets… So far, I have knitted 15 dish cloths, one scarf and an afghan for my wheelchair. Sure would like another project! Love the taupe colors. I would make a blanket for myself with those colors, probably a large block one. Berroco yarns are so nice to knit with and knitting a blanket would give me the opportunity to learn new stitches and keep me warm. I will make a blanket for my mother that is 87 years old. I would love to build a blanket with all that texture! Would sooooo LOVE to be able to design a NEW Afghan!! ALWAYS like a new challenge!!! My creative juices are active today1 I need a new project for these cold winter days and nights. I love the look of this blanket in tans and browns. It would surely fit right in my family room. Am I a lucky winner? Please and thank you.! I’ve never seen a blanket knitted like this. It’s beautiful. I’ve crocheted some but nothing like this. Would be neat to learn something new. I’d love to design and nit a blanket just for me! My cats have taken over the Afghan my Mom made me! This would be a wonderful challenge to advance my “self taught” knitting skills! This afghan is “simply country” and I LOVE IT! I would love to knit a blanket for my husband. He is always cold. I love taking stitches and applying them to a basic pattern to create something unique. It gets my creative juices flowing and makes me think out of the box. My 2015 wish is to make a knitted afghan so my little dog and I could snuggle the cold away. People elsewhere seem to think we would never need a blanket here in Phoenix, AZ – but this is “high desert,” and when temperatures do drop, the thin dry air makes them feel even colder. (Plus, we’re not accustomed to the cold, so we feel chilled at a higher thermometer reading than someone from, say, Chicago.) So I’d love to have a big warm blanket made from chunky yarn to keep me toasty on our cold nights. Finally have the time now that I am retiring. I would love to win this book and yarn for a blanket. I really like the idea of converting swatch samples into blankets. This would allow the versatility of making it the size you want. Next project will be a blanket for my 94 year old mother! I’m ready to design a blanket because a) I’d like a new one, b) I would like to make it myself and c) I can never leave well enough (or any pattern) alone! Love that sample, creating my own would be fun. Love my Grandmother for teaching me to knit 50 years ago! Just learning to knit, so a good blanket stitch guide in my library would be much appreciated. What a great give-away……I need a new blanket in our TV room. Thank! Perfect time of year to make a blanket and learn new stitches!!! My dogs and l love blankies!!! I would love to knit the designs dancing in my head. Love the design possibilities this book offers! With grandchild number 17 on the way, I need to make a baby blanket. All the others have one, so this one needs one too. I love projects that use different stitches – especially cables which I have found myself to be in love with. I haven’t made a blanket yet so this giveaway sounds perfect! Thanks for the opportunity to win it! Great giveaway, cannot wait to get started on the new afghan blankets for gift giving, and one for myself of course! Making a knitted blanket is on my list of things to do. This book is perfect for that as pattern aren’t easy to locate. Thank you for the opportunity! I’m new to knitting and look forward to this web site/ products. It’s a good find. Following a pattern gives you a lovely knitted piece but if you make it your own by choosing the stitch pattern then you can add little extras as you go for a truly unique work of art. We love a cozy blanket to snuggle under when sitting on the couch. How fun to design my own pattern! I would love to just be able to learn how to knit better as I am a newbie to this craft. Then maybe I could design a throw later on. Because blankets are kitty magnets! My kitty is getting old and deserves her own special perch. Such neat designs! Thanks for a great giveaway! It would be a great way to practices knitting on cicrular needles. I need a soft warm blanket to snuggle in, cause baby it is cold outside and fuel is expensive, living rooms are chilly. What else can I say? I began a year ago and I can’t and won’t stop knitting! One of my New Year’s resolutions is to learn something new every week. This would be a great way to not only do that but also expand my knitting skills. I am an okay kind of knitter but I really would like to be better and enjoy it more. Yes I am ready! This book would really help! I like the idea that you can use one stitch and knit an afghan or blanket or use many to make a sampler. That gives me many options for lots of great knitting. I always love to come up with my own designs. I would love to learn some of those new patterns to make blankets for my family. I love knitting but I’m not very skilled so I could use some new instruction. I like to experiment with different patterns when knitting blankets and this book looks like a treasure trove of them. I’m just adding tulip border to my tree of life afghan so am looking for a new blanket to knit. Love the sampler effect of the image from the Build a Blanket cover. I’m ready to design a blanket as every pattern I now see has something about I want to change. So i edit patterns, but really probably should design my own. Great giveaway and I really hope I win! Thanks for the chance! I love the basketweave/checkerboard stitch on 8 rows. (Work multiple of 8 stitches and 5 extra stitches) Row 1 and 5 (Right side): Knit all stitches; Row 2 and 4: Knit 5, *purl 3, knit 5; repeat from * to the end of the row; Row 3: Purl 5, *Knit 3, purl 5; repeat from * to the end row; Row 6 and 8: Knit 1, Purl 3, *Knit 5, purl 3; repeat from * to the last stitch Knit 1. Row 7: Purl 1, Knit 3, * Purl 5, Knit 3; repeat from * to the last stitch Knit 1. Repeat. It looks more complicated than it is, and, I’ve made a vest from it that always gets admired! What a beautiful blanket! Would love to make on a put it over my husband who is sleeping in his chair at the moment…one make with love. Would like to design my own blanket and learn new stitches. Love the patterns. They hide my uneven gauge. I’ve had it on my to do list to try a block blanket using different pattern stitches. My thought was that it would be a great way to learn and practice stitches. Hi, this book will give everyone the opportunity to learn new techniques and be creative in doing their own blanket. Thank you for giving us the chance to win both the yarn and thé book. I am a beginner and do cable stitches. Would like to learn more. I have been looking for a pattern to make a blanket and haven’t found one yet….. I would love to learn to make a throw. A book and good yarn would get me started. Thanks for a chance to start a new adventure! I don’t think I am ready to design my own, but love trying new stitches and patterns. 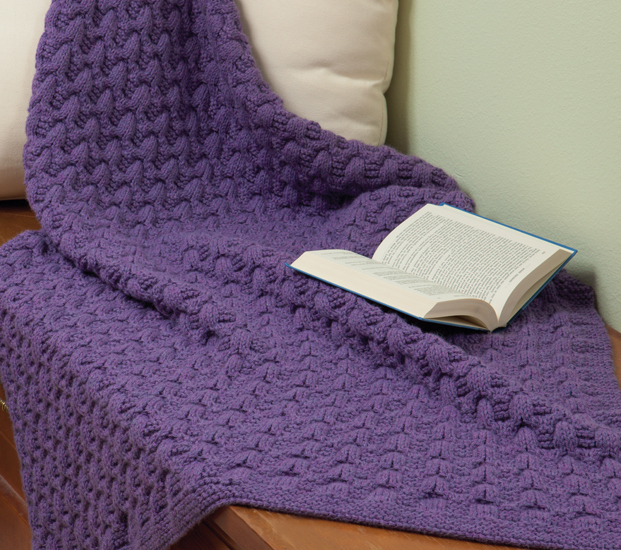 I love knitting the waffle stitch for blankets, but would love to win the booklet and yarn to explore other stitches. I love the idea of designing my own blanket with an unusual stitch pattern or combination of patterns. Using up odd bits of yarn might be fun, but I love the look of the brown and beige blanket above. I love the Forked Cable patterned blanket shown! This is likely the stitch I would use for my blanket, should I win! I have lots of left over yarn from Christmas projects! Making one of the patchwork blankets would be a great way to use up the yarn while practicing new stitches. I so love the block blanket. I have more dreams than I usually get done. This looks very do-able to me (for me)……….and I REALLY need to replace the throw on my couch that I got 5 years ago at Big Lots !!!!!! I also quilt so the afghan I am working on is a combination of strips of flying geese & Aran design. Knitting a blanket would be a great way to practice different stitches — patterns. I am ready to experiment with even more new stitches in a blanket. I have been working on a blanket with about 10 different cable stitches/twists and thoroughly enjoyed it. I will be donating it to a local charity group to give to someone who needs something warm. I would like to do another blanket or sampler really just to see how different stitches come to be. I love cables and the different textures it produces so I am hoping to knit a blanket utilizing cables and several other stitches. So this book would be quiet beneficial in helping me achieve this quest. I love the looks of the purple blanket. Would love to win a book and yarn and be able to pick up a pair of knitting needles again. I need to design my own blanket so I can use up the tons of yarn I am storing in plastic tubs. I’m COOLD! I need a warm blanket! It would be so exciting, but difficult to settle for one pattern to build a blanket. But it would be a good excuse to buy more yarn for the next project. Have a first grandchild on the way and would love to design a special blanket for her. Would also like to use the stitch ideas in creating hats that I donate for charity – Newborns in Need, Chemo caps. I make a lot of hats and would welcome some new ideas. Have a first grandchild on the way and would love to design a special blanket for her. I would also appreciate new stitch ideas to incorporate in the many charity caps that I make for Newborns in Need and Chemo caps. We’re expecting our first grandkid! Would love to learn some new stitches and make some blankets! Thanks for the chance to win!